Experience and learn about the rich history and culture of Utrecht and its environs by joining your fellow HSS attendees on an excursion! All excursions will occur on Tuesday, 23 July 2019. Summaries of excursions are provided below. Book now, as space is limited. Start this tour by exploring the city on foot, together with a local guide. There's plenty to discover in the city centre of Utrecht. Turn into a random side street and you'll forget for a moment that you're in the middle of the city. You'll find yourself suddenly in a hidden courtyard, a beautiful garden or a narrow alleyway with a special story. These are Utrecht's forgotten places where time seems to have stood still. The walk will lead us to the Sonnenborgh museum and observatory. At the historic 19th century observatory, Buys Ballot pioneered meteorology. Later, Minnaert and his students investigated the composition of the sun. Today, Sonnenborgh is a museum and public observatory. Learn all about the unique building, the stars overhead and the weather, or take a virtual journey through the universe in the planetarium. The Sonnenborgh was built on a monumental 16th century city wall bastion, one of the best-preserved in Northern Europe. The walk will lead us to the ‘Oude Hortus, the old Botanical Gardens, a green oasis located behind the University Museum. The history of the Utrecht botanical garden goes back to 1636; the orangery dates from 1724. The greenhouses, which were built in 1906-08, hold a great selection of plants and flowers, like the impressive Victoria Longwood. The 250-year old Ginkgo Biloba is one of the oldest known specimens outside of Japan. We will depart by private coach to the National museum of Amsterdam, “the Rijksmuseum”, which houses the largest collection of paintings by Dutch masters in the world, including masterpieces by Johannes Vermeer, Frans Hals, Jan Steen and of course Rembrandt, including his Night Watch. This excursion includes a visit to workshops of the ARTECHNE – Technique in the Arts 1500-1950 project, www.artechne.nl. This project integrates methodologies typical for the humanities and historical disciplines with laboratory work, experimentally reconstructing historical recipes to understand how technique in the visual and decorative arts was transmitted. It connects research in history of science and technology with the expertise in conservation, restoration and technical art history. Small lunch packages included. We will depart by private coach to Huygens’ Hofwijck house in Voorburg, where Christiaan Huygens (1629-1695) lived and worked for the last seven years of his life, and wrote his famous Kosmotheoros. The house, one of the most beautifully preserved monuments from the Dutch Golden Age, was designed by his father Constantijn. Some of Christiaan’s original instruments are on display. After this visit, we will depart by private coach to the Museum Boerhaave, the national museum for the history of science and medicine in Leiden. The museum hosts a unique collection of historical scientific instruments from all disciplines, including original instruments of Huygens and Van Leeuwenhoek as well as the apparatus with which Heike Kamerlingh Onnes first liquefied helium in 1908. The museum is located in a historic building: originally a convent, it became the first academic hospital in Northern Europe as St Caecilia’s Hospital. Some three hundred years ago, Herman Boerhaave instructed his students here at his patients’ bedside. At Boerhaave, you will be received by one of the senior curators of the museum. Small lunch packages included. We will depart by private coach to the Teylers Museum in Haarlem. Established in 1778, Teylers Museum is a uniquely preserved 18th-century public knowledge institution for the arts and sciences. It has been open to the public since 1784, welcoming all those who are eager to look at objects of interest in the visual arts and the sciences. It is the only authentic 18th-century museum interior in the world. The 19th-century rooms have preserved the spirit of that age: time appears to have stood still here. Teylers museum combines art, natural history, and science museum. Its holdings include fossils, minerals, scientific instruments, medals, coins, and paintings. The heart of the museum is the neoclassical Oval Room (1784). One of its many marvels is a giant electrostatic generator from 1784.The museum was founded by Pieter Teyler van der Hulst (1702–1778), a wealthy cloth merchant and banker of Scottish descent, who bequeathed his fortune for the advancement of religion, art, and science. You will be received by one of the senior curators of the museum. Small lunch packages included. 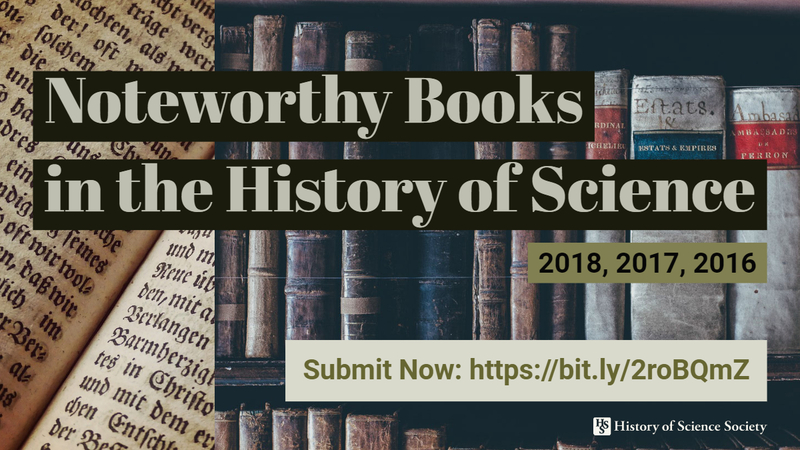 What was a noteworthy history of science book published in 2018? Or, because we all know we’re a bit behind on our reading list, published in 2017 or 2016? Below are the instructions for abstract submission. We include them here for easy reference; however, they are also on the Abstract Submission page, where you can submit your abstract. You can find a PDF of the Call for Papers on the Documents page. Please read instructions carefully, as they have changed from previous years. Failure to comply fully with instructions or to complete the abstract submission process completely will preclude your submission from consideration. Nonrecurrence Rule: Anyone presenting an individual paper, flashtalk, or on an organized session or roundtable (including commentators) cannot appear on the meeting program in any other capacity. Please note that roundtable presenters are also subject to this rule. Exceptions are allowed for individuals serving more than one role in a single session (e.g., moderator and presenter) or as a presenter on one session, but organizer or moderators on another. Other allowances will be made for presenters in special circumstances. Diversity: To promote diversity at the annual meeting, we ask for demographic data, academic affiliation, and presentation history. Reviewers will use this information in evaluating abstracts. While providing this information is optional, refraining from it may affect the evaluation of your proposal. You and your co-presenters can update your personal information by visiting your profile via your dashboard on the meeting website. Collaboration: Historically, Organized Sessions enjoy the highest acceptance rates. If you'd like to find collaborators for a panel, visit the Discussion page on the meeting website. There, you can post what you're looking for or see what others have already posted. Alternatively, you can also post on Twitter, with the hashtags #hss2019 #collab. Profile Photo: If you've uploaded a profile photo, please note that it will be visible to reviewers. If you'd like to prevent this, delete your profile photo and reupload it after your abstract has been evaluated. Word Limit: All abstracts must be 250 words or less. Selection Guidelines: The Committee on Meetings and Programs (CoMP) has established a set of best practices and guidelines for proposal. Program chairs will look to these best practices and guidelines when accepting abstracts for the 2019 meeting. Increased Funding: Because the meeting location may be more expensive for many of our attendees, HSS has increased the amount of funding available to graduate students, recent PhDs (received in the last five years), and independent scholars via NSF travel grants. Application for these grants will open after abstracts decisions are shared. Contributed Paper: Presentation on a theme in the history of science around 20 minutes long. Submitted by an individual for inclusion on a panel formed by the program committee. Organized Session: A panel comprising four or five presenters (including a commentator), submitted by an organizer. Roundtable: Facilitated discussions about the history of science or state of the discipline, submitted by an organizer. Flashtalk: Open to graduate students only. Presentations (with a single slide) of five minutes or less. Choose Contributed Paper as submission type. Complete required fields, which include Abstract Title, Abstract Topic, Abstract Summary, Chronological and Geographical Classification. Click Submit when all fields are complete. You can update or edit your abstract at any time via your Dashboard. Before you begin, you will need the following information: the titles, abstracts, names, and email addresses of all panelists. Additionally, if any panelists already have accounts on the meeting website, use the name and email associated with that account. If you're unsure about whether the presenter has an account, use the Contact Us link in the navigation menu to inquire. Choose Organized Session as the submission type. Complete required fields, which include Abstract Title, Abstract Topic, Abstract Summary, Chronological and Geographical Classification. Complete additional fields as needed, such as whether the session is sponsored, which is a factor in evaluation. Abstract 1 (visible in the purple banner above the Submit Abstract heading) designates the abstract for the panel as a whole. On Abstract 1, you should also add your moderator, commentator, and additional organizers (if applicable). To do so, go the bottom of the page. Under the Add Presenters, Commentators, & Moderators header, click Add Co-Author+. Add the names and emails of commentators, moderators, and organizers. You don't need to make them Primary or Presenting Authors. To add your panel's authors, titles, and abstracts, click Add More Abstracts (located at the bottom of the page). A new tab will open that says Abstract 2. Here you will add the abstract info for your first presenter and complete all required fields. At the bottom of the page, under the Add Presenters, Commentators, & Moderators header, click Add Co-Author+. Enter the name and email of the abstract's author and click the boxes for Primary and Presenting Author. Click Add More Abstracts for as many presenters as you have, following the same procedure. Once you're finished entering all abstracts, click Submit. Each of your panelists will receive notification that they've been added to the abstract. If you gave them the ability, they will also be able to log in and edit the abstract. You can edit it at any time by going to your Dashboard on the meeting website. Choose Roundtable as submission type. Add your roundtable presenters, commentator(s), moderator(s) via the Add Co-Author+ button under the Add Presenters, Commentators, & Moderators header. You must add the name and email of each roundtable presenter and choose Presenting Author for all presenters and commentators, but not for moderators. If any of the panelists already have accounts in the meeting website, enter the name and email associated with that account. If you're unsure, use the Contact Us link to inquire. Once all information is added, click Submit. Each of your panelists will receive notification that they've been added to the abstract. If you gave them the ability, they will also be able to log in and edit the abstract. You can edit it at any time by clicking on My Dashboard on the meeting website. Finally, ensure that you and your panelists have each updated your Profile information, which is also accessible via your Dashboard. Your profile information will be used by reviewers during abstract evaluation. Failure to provide this information may disqualify or hamper the success of your submission. In particular, you need to complete the fields for abstract submission role (organizer, commentator, etc. ), presentation history, affiliation, and demographics. Choose Flashtalk as submission type. Finally, ensure that your Profile information is up to date. It is also accessible via your Dashboard. Your profile information will be used by reviewers during abstract evaluation. Failure to provide this information may disqualify or hamper the success of your submission. In particular, you need to complete the fields forabstract submission role (organizer, commentator, etc. ), presentation history, affiliation, and demographics. To preserve formatting of your abstract across platforms, only plain text is supported for abstracts. This means that bold, italic, and other formatting is not possible. Once the program committee makes their decisions, HSS will notify you by email. Use the contact form to submit additional questions. The official hashtag for the 2019 annual meeting is #hss19. Why not #hss2019? Because two characters can make all the difference. Use the official hashtag to share any news, updates, facts, points of interests, dramas, etc. about the meeting. Also, if you're looking for collaborators to submit a panel for the meeting, you can use the hashtag #hss19 #collab to find collaborators via Twitter. You can also use our Discussion board. Are you planning on livetweeting all the goodness that will be HSS 2019? Do you like to post comments, theories, papers, photos, etc. during the meeting? Please join our Twitterdex by submitting your information. 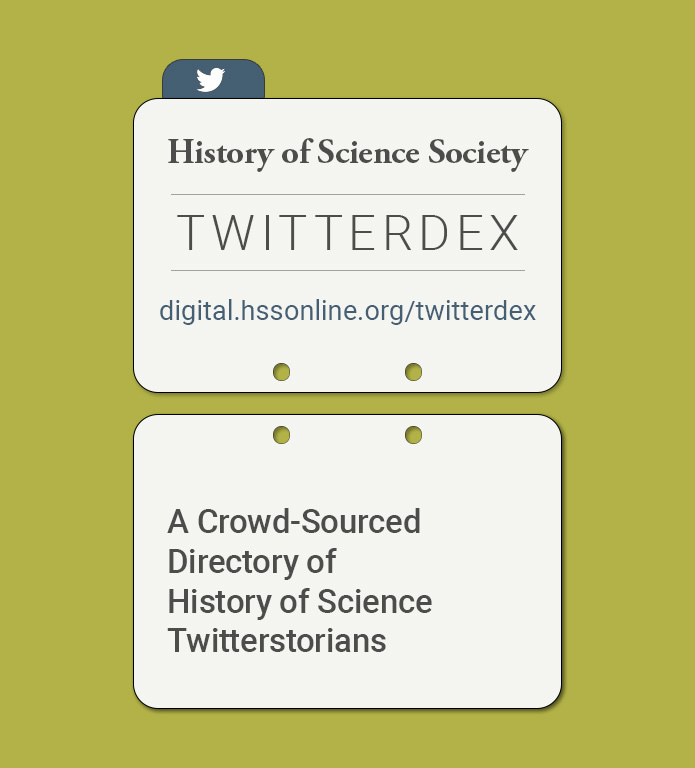 As the meeting approaches, we'll release the directory, so historians of science the world over know who to follow to keep apprised of the latest and greatest scholarship in the history of science. Our Twitterdex is now live and updated weekly. Check it out. Abstract topics and examples are listed below. The examples are not exhaustive, but meant to give you a guide as to how you should classify your submission. If you have questions or suggestions about the topics, please use the Contact Us link in the navigation menu.